Sapphire is the mordern and traditional september birthstone , as well as the zodiac birthstone for taurus. The agate and moonstone are the alternative birthstones for september. When we talk of sapphires, as we all very well know, we think of blue. Sapphires, same as the ruby, belong to the corundum mineral family. The matter of fact is that this magnificient gemstone comes in many other colors as well, such as green, purple and pink. 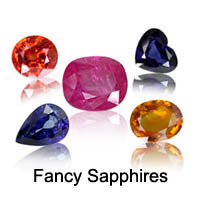 In fact sapphires comes in all the colors of the rainbow , excepting ofcourse the pure red ones, which are rubies. Now these fancy colored sapphires are called fancy sapphires or colored sapphires. Sapphires are very tough ( 9 on the Moh's scale), second only to the diamonds (10 on the Moh's scale). In other words, a sapphire gemstone is much more harder than say an emerald gemstone, amethyst crystal, aquamarine gemstone, garnet and agate gemstone. Nowadays a majority of the sapphires in the marketplace have gone through a variety of treatments designed to improve their color and clarity. 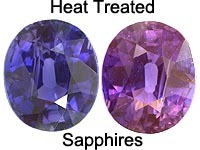 Most of the sapphires though are heat treated to enhance their color. Ethically speaking, all sapphire treatments should be fully disclosed by dealers. The Persians believed that the earth rested on a giant sapphire, whose reflection made the sky blue. As the zodiac birthstone for taurus, it protects and cures the taurus wearer from mental disorders. The sapphire gemstone symbolizes trust, sincerity, honesty and fidelity in relationships, and to bring peace, joy and wisdom to the wearer. Not suprisingly , then, that sapphire engagement rings are so popular. Great quality sapphires used to come from Burma (now Myanmar) and Kashmir (India), but both the two areas nowadays produce very little sapphires. Most of today's sapphires come from Sri Lanka and Madagascar. Sapphire also comes from Thailand, Tanzania and Cambodia. Their value of a sapphire depends on the size, colour, transparency and the origin of the gem also playing a major part. The most valuable are genuine Kashmir sapphires followed by the Burmese sapphires which are valued almost as highly, and then comes the sapphires from Sri Lanka. The possibility of the gemstone's having undergone some treatment or other is also a factor in determining the price, since gemstones which can be guaranteed untreated are becoming more and more sought-after in today's world. And if the stone selected then also happens to be a genuine, certificated Kashmir or Burmese sapphire, then the price will probably reflect it. 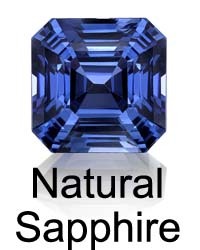 So, personally speaking from my viewpoint, if you are thinking about a gemstone - choose sapphire. They are practical, durable, beautiful, absolutely magnificient, very intense and moreover they are precious stones. What's more, any color will do!